Takeuchi Skid Steer has 3 different models, the TS50, TS60 and TS70 and are all available in either radial or vertical lift path. Offering different lift paths is great if your machine is being used for specific tasks, such as a vertical lift would be best for using an auger or hammer where as radial is best for buckets or forks. Monster Tires understands the need for specific tires for specific tasks and when you call us we can help you understand which tread pattern and tire is best for your use, Contact us today to find out more about the Takeuchi Skid Steer Tires we offer.Takeuchi Skid Steers are great machines, and they deserve great tires to roll on. At Monster Tires, we have high quality, affordable construction tires for your Takeuchi TS70 or TS50-TS60. Our full range of Takeuchi Skid Steer Tire Size Options means that you can find the tires you need for your Set of Four Tires for Takeuchi Skid Steer, Front Tire Set for Takeuchi Skid Steer, or Rear Tire Set for Takeuchi Skid Steer. 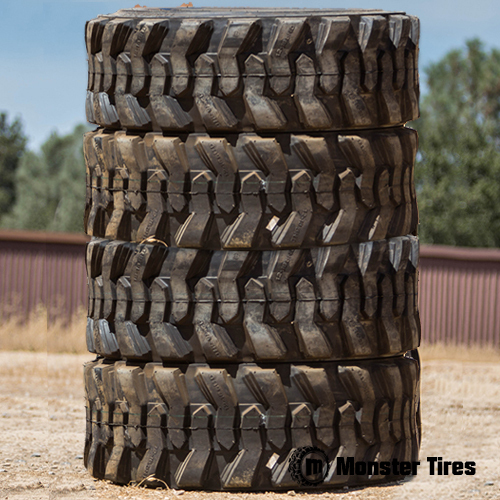 Trust the Dependability and Reliability with Monster Tires. Your construction company depends on your heavy equipment, which means you need to be able to rely on your Takeuchi Skid Steer Tires. At Monster Tires, we offer the best quality in Construction Tread Tires for Takeuchi Skid Steer as well as Off the Road Tires for Takeuchi Skid Steer. We provide High Quality OTR Tires for construction companies and home owners, and we give great deals on the Heavy Equipment Tires you need to get your piece of equipment rolling again. Trust in Monster Tires for your next set of Takeuchi Skid Steer tires!